It's really this simple: Vertical stripes are your friend. Whether bold or subtle, a graphic explosion or a tailored presentation, or even a pajama-esque hint, vertical ventures run the gamut. It's really this simple: Vertical stripes are your friend. Whether bold or subtle, a graphic explosion or a tailored presentation, or even a pajama-esque hint, vertical ventures run the gamut. We really like stripes on muted colors. Definitely chic. What unites the vertical stripe on dresses, blouses and pants is not only its precision but its visual effect--when another's eyes travel up and down, it elongates our figure. Taller and slimmer? Yes, we'll take it. Dries Van Noten The man knows how to design clothes that are both timeless and dramatic for real women's bodies. We love this matching shirt and trouser, which resemble men's pajamas. Altuzarra This designer's love of shirt dresses is well-documented. A striped one will make you look longer and slimmer and will never go out of style. Worth every penny. 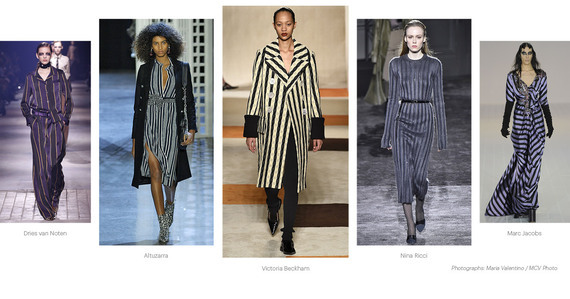 Victoria Beckham For all of you who live in black, here's how to update your wardrobe for Fall in an instant: a striped topcoat! Snappy! Nina Ricci Understated elegance for the ages. A knit dress in a beaded shadow-stripe is the ultimate flatterer. Perfect for so many occasions. Marc Jacobs Chevron stripes, which angle across a woman's curves, are like a secret weapon. They focus the eye inward and give the illusion of a narrower silhouette. The vertical jewel-embroidered lapel also elongates. What's not to love? Make your life easier These are wardrobe solutions for busy women. When you want to look good and be comfortable, what could be a better choice than the Ace & Jig dress, the Banana Republic pant (practically pajama-level comfy) or the Grey Jason Wu skirt? Flattering factor We think all vertical stripes are kind, but some are extra enhancing while keeping the chic quotient high. Note how the Altuzarra skirt elongates but enhances curves too. And the Opening Ceremony is a fitted dress, but thanks to both vertical stripes and its structure, you will look curvy in just the right way (wear heels to complete the silhouette). Mix and match heaven Striped separates combine beautifully with solids. We love the Top Shop blazer, the Crosby trousers, the La Ligne shirt, the Nicholas pants (high-waisted vertical stripe pants are particular standouts). A pop of stripes Even if your look is built on solids, you can add visual interest with a chic handbag. Who can say no to the Chloe striped suede tote or the Ferragamo small leather cross-body bag? We didn't think so!